Anthropologists condemn the use of terms of "stone age" and "primitive"
Good news: British anthropologists take part in public debates. The ASA (Association of Social Anthropologists) issued a statement where they "condemn the use of terms like 'stone age' and 'primitive' to describe tribal and indigenous peoples alive today". We anthropology bloggers have often criticized the use of these terms. The ASA has become the latest supporter of Survival International's campaign against racism in the media which challenges the use of terms like 'stone age', 'primitive' and 'savage' to describe tribal and indigenous peoples. Terms like 'stone age' and 'primitive' have been used to describe tribal people since the colonial era, reinforcing the idea that they have not changed over time and that they are backward. This idea is both incorrect and very dangerous. It is incorrect because all societies adapt and change, and it is dangerous because it is often used to justify the persecution or forced 'development' of tribal peoples. The results are almost always catastrophic: poverty, alcoholism, prostitution, disease and death. Other supporters of this campaign include prominent journalists such as John Simpson, John Pilger and George Monbiot. According the Washington Times, the American Anthropological Association did not return calls for comment. But why do they still use the term tribe in their campaign? Why not use society or community? Doesn't the term tribe imply something similar as "primitive"? As I've mentioned earlier, several African scholars argue that the idea of tribe promotes misleading stereotypes and that "anyone concerned with truth and accuracy should avoid the term "tribe" in characterizing African ethnic groups or cultures". Tribe has no coherent meaning. Tribe promotes a myth of primitive African timelessness, obscuring history and change. In the modern West, tribe often implies primitive savagery. Images of timelessness and savagery hide the modern character of African ethnicity, including ethnic conflict. Tribe became a cornerstone idea for European colonial rule in Africa. Black Britain sheds more light on the use of this term. Several scholars, among others sociologist and cultural historian Lez Henry say that Survival and the ASA should also examine their use of the terms ‘tribe’ and ‘tribal.’ Henry says, people in Africa who live simple agrarian lifestyles are often seen as ‘primitive.’ Such notions served as justification for the colonisation of countries designated as ‘third world’. For Ekwe Ekwe, the term ‘tribe’ conjures up images of being unsophisticated and away from technological advancement. "The ASA does not support the use of the term 'tribal' to describe people...We share your concerns about the use of the word in perjorative ways in the same vein as primitive, etc. "However, we do support the overall aim of the campaign which is to change perceptions and work against racism and outdated ideas of social evolution. Hence we wish to support Survival International's aims even if the wording is difficult." 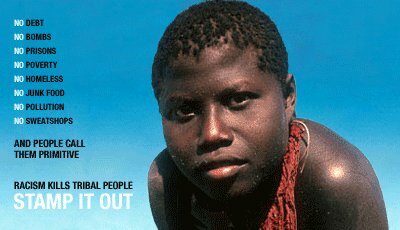 Primitive Racism: Reuters about "the world's most primitive tribes"
"Good story about cannibals. Pity it's not even close to the truth"
This whole ‘tribe’ thing is something of a specialty of mine. Two classic sources people might be interested in reading are “The Concept of Tribe” by Morton Fried and “The Illusion of Tribe” by Aidan Southall. A tribe is a type of community. It does not imply them to be primitive unless you are ignorant of what the term really means. We assume too much of words. Tribe is really eh same as saying “suburb or rural area. I’d rather say we assume too little of words and reflect too little about it. If you use “tribe” the way you described, that’s fine, but as shown here, it’s mostly used in a different way.